in grand style with this special 4 CD set! Featuring over five hours of great film music! Produced as a companion piece to their best-selling 25th Anniversary set, there is no duplication here.For their 30th Anniversary Celebration they look back at their greatest releases over the last five years. And being most prolific film music record label in the world, that meant they had over 250 soundtracks to choose from! 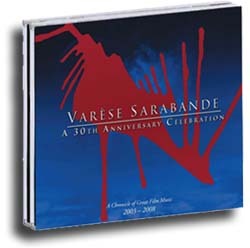 Averaging over 55 new soundtrack releases a year, Varèse Sarabande's catalog features virtually every great name in film music. A list of just a few of the composers included here includes the late Jerry Goldsmith, along with Hans Zimmer, Danny Elfman, Thomas Newman, Alan Silvestri, James Newton Howard, Mark Isham, Graeme Revell, Trevor Rabin, Patrick Doyle, James Horner, Mychael Danna, Michael Giacchino, John Debney, Marco Beltrami, John Powell, Gabriel Yared, Brian Tyler and many more! Also included are some truly wonderful scores from some films you might have missed completely! 4 CDs priced for little more than a single it's almost a giveaway!